Have you heard of Greek mountain tea? Ukrainian TV Channel, ZIK has reported the discovery of a burial of a female Scythian warrior – who is thought to have been part of the fierce all-female tribe of Amazons mentioned by the Hellenic epic writers and then the historian Herodotus. 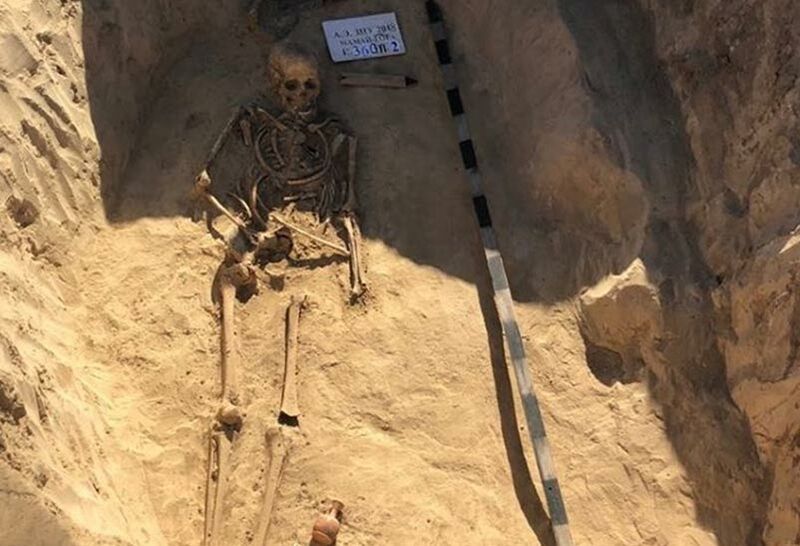 The find of a skeleton accompanied by grave goods and weapons associated with this noble fighting class has been found by a group of archaeologists, students and volunteers who conducted an archaeological expedition to Mamai Hill, Ukraine. The burial of a female Scythian warrior is located in the Great Znamyanka, Kam'yansko-Dniprovskyi District, Zaporozhye region of Ukraine. The burial place that has been found is aged around 2400 years. Due to the location, age, and the grave goods that have been found, it has been assessed that this is likely to be the grave of a member of the Amazon warrior tribe , thought to be closely related to the Scythians, that legend claims lived and roamed in in various locations around the region. The excavators of the Scythian lady buried in Mamai Hill have also recovered a miniature jar - or lekythos to the Greeks, in which contemporary women of noble origin kept perfumes or aromatic oils. This was one of the indications that the grave was of a high-status woman. Other items found in the burial are exquisite bronze lanterns, bronze arrow heads and two lead spinners. The arrow heads are indicative that the woman was a warrior. A well-preserved bronze mirror was also found. As well as serving the aesthetic purpose, mirrors also had a certain sacred function for the ancient peoples and were related to the ‘otherworld’ of the afterlife. That is why this item sometimes occurs, in particular in women's Scythian burials. The distinct outline of the funeral pit was noticed by archaeologists after the trench was removed by a bulldozer. From that moment on, the more delicate manual excavation and cleaning around the area of the grave took place. It remains for the anthropologists to determine just how old this Amazon was when she died and what was the cause of death. Whether this was a warrior that died in battle, from illness or even natural causes remains to be found out. These are not the first finds of warriors suspected to be Amazons. According to the New York Times, similar graves were found by Russian and American archaeologists among Sarmatian tribes at Pokrovka. The Sarmatians in Herodotus come from the union of Scythians with the Amazons. From the grave goods and other evidence, the first among this race were women warriors. The burials appeared to be associated first with the Sauromatians and then the early Sarmatians. These were Indo-European-speaking herders who lived on the steppes in the sixth to fourth century BC, and fourth to second centuries BC, respectively. For more information and many more images of the finds, please visit Ancient Origins.